I felt a little embarassed ordering it though because the crew had to make a second glance at me while putting my order on screen, like asking me, are you sure sir? He also even had to ask someone if they still have it. 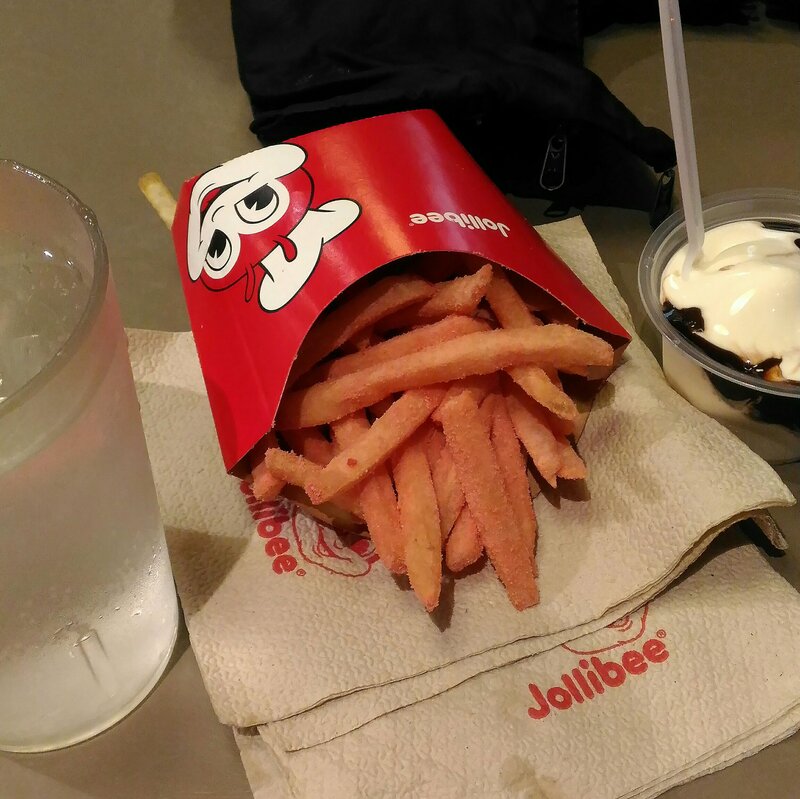 Looking at the fries which color is paler than their ad, I had to ask Jollibee in my head, why? Whose wacky idea was this? The process must have been interesting. It smelled really sweet which I somehow expected. The first taste was surprisingly not that bad, but not the type I would crave to have again. The strawberry flavor has a resemblance to Rebisco Cream-filled Cracker, only more sour. It tasted like sweet pastry, like churros, which was okay but my mind kept reminding me that it’s my classic fries and that’s when it gets off. It felt like being in a party and bumping with a childhood friend whom you haven’t met for a long time when lots of things have changed, and when this certain greasy aftertaste you’re very familiar with reveal itself inside your mouth, it reminds you of the good old times you can’t go back. Yup, it’s sad as an Adele song. Maybe I’m not part of the target market and the original deep fried fries is just strongly engraved on me. I give an A for their willingness to get out of the box, but this just didn’t work for me. This entry was posted in Journal and tagged fastfood, food, fries, humor, Jollibee, Journal, review. Bookmark the permalink. Felbertson Sotto studied Architecture and Fine Arts at Polytechnic University of the Philippines. He lives in Taguig with his parents, two sisters and a dog named Rancho. Architect Licensure Exam: How’s the waiting game going? Belated #HappyChristeningBabyZooey 👶👼💞 It was my first as a Catholic church ninong and may you excuse your tito as I had no idea how to properly put a sign of the cross on you, bibi (if there really is). I cluelessly "dialed" a cross on your forehead, like on a fone for pizza. Huhu! That's quite memorable. 😂😅😫 I can't believe how time flies fast. Suddenly, you're starting to learn how to walk! We thank God for blessing us, especially your parents, with this cute little angel that you are now. With that, Congratulations Ben and Faye! 👨‍👩‍👧 You're lucky to have a mom who's my favorite bedtime storyteller. May you fill your head with fairy tales to great dreams, and be as tough and endearing as your mother. Belated Happy #InternationalWomensDay to her and all the ladies out here!